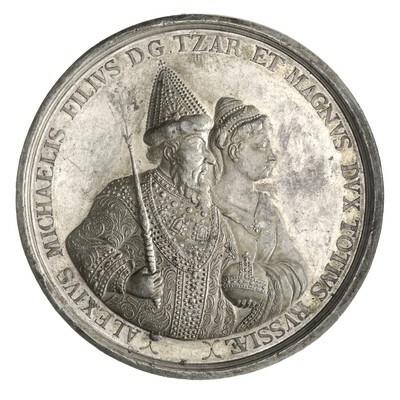 Obverse: ALEXIVS MICHAELIS FILIVS D.G. TZAR ET MAGNVS DVX TOTIVS RUSSIAE (ALEXII MIKHAILOVICH, CZAR AND GRAND DUKE OF ALL RUSSIA, BESTOWED UPON HIM BY GRACE OF GOD) - half-length portraits of Czar Alexii Mikhailovich and Czarine Natalia Kirillovna wearing rich attire r.; crowned Czar holds orb and scepter. Reverse: SPES MAGNA FVTVRI//PETRUS ALEXII FILIUS/NATUS 30 MAII/MDCLXXII (in ex. )(GREAT HOPE FOR THE FUTURE//PETR ALEXIEVITCH/BORN 30 MAY/MDCLXXII) - Winged angel seated on clouds, holding infant Peter towards crowned female figure embodying Russia; shield with Russian coat or arms at right. 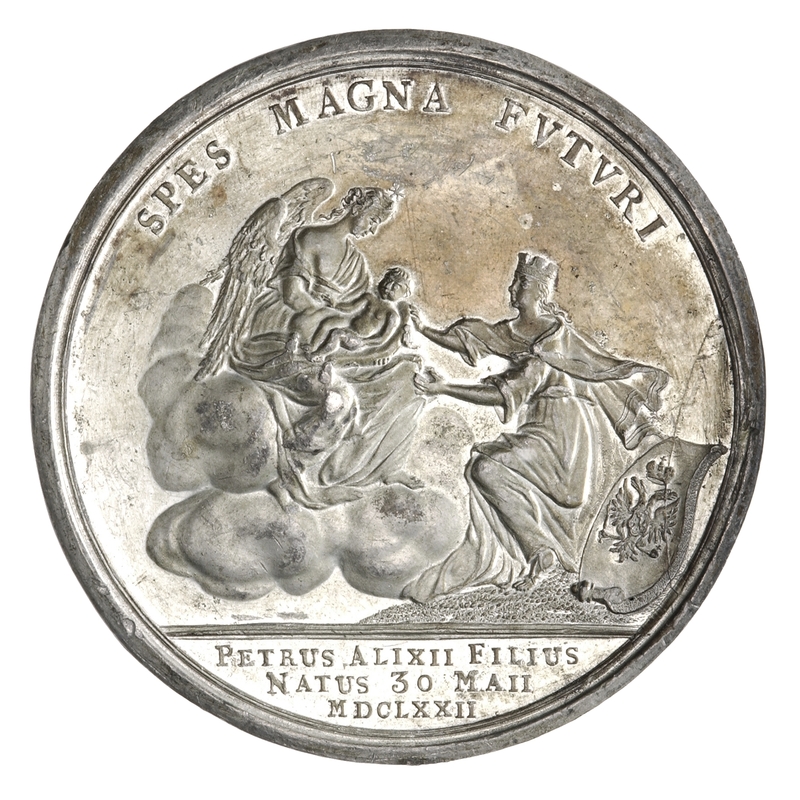 Note: This medal commemorating the birth of Peter the Great is an unsigned copy of the original medal executed by Peter Paul Werner who was active as a die cutter until 1771.